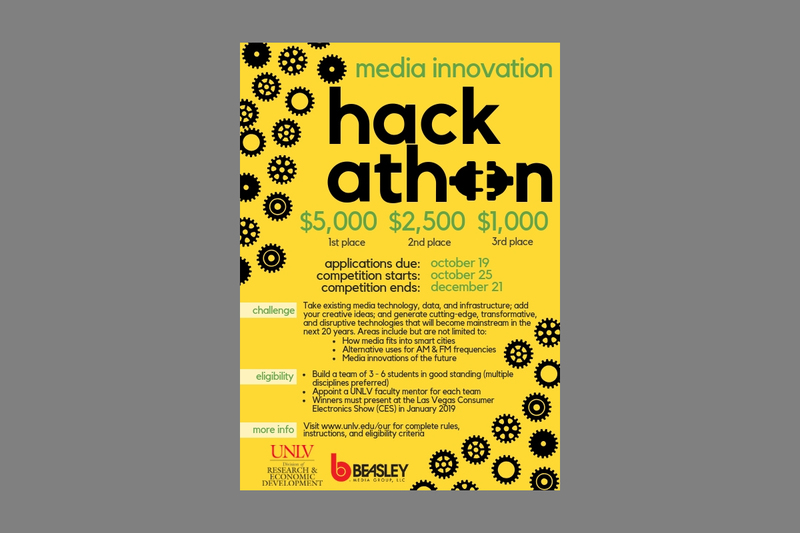 As part of Beasley Media Group’s ongoing commitment to innovation, the company is collaborating with the University of Nevada, Las Vegas (UNLV) to offer students the opportunity to innovate in the media space through a semester-long hackathon, the Media Innovation Hackathon. The focus of the hackathon is the generation of commercially viable products and services that utilize existing media technology, data, and infrastructure as well as the ideation of cutting-edge, transformative, and disruptive technologies that will become mainstream in the next 20 years. Alternative uses for AM and FM frequencies. Media innovations of the future. The University of Nevada, Las Vegas is an innovation leader in the areas of urban design, renewable energy, sustainability, and more. UNLV students interested in participating in the hackathon will submit an initial application identifying their team and providing a brief description of their innovative idea. Up to 10 teams will be selected for the final hackathon. An awards ceremony will be held the second week of December, during which the top three teams will receive cash awards. Awardees will be featured at UNLV’s booth with Beasley Media Group at CES 2019 in January 2019.